Sick of snow? Spring is coming... eventually. And the Cherry Blossom Festival is ready. Shortly before the blizzard slammed D.C., festival planners announced the dates for the National Cherry Blossom Festival, which will run between Sunday, March 20 and Sunday, April 17 this year. Even 104 years after receiving the first gift of cherry trees from Japan, the trees and festival activities attract 1.5 million visitors every year, according to the festival website. The best activity of the festival? Up-close and personal views of the blossoms surrounding D.C.’s Tidal Basin, of course. 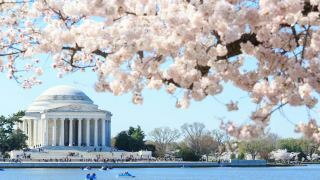 But the National Cherry Blossom Festival also features four packed weeks and three weekends of events you can enjoy when you're not gazing dreamily at the blossoms. We have a quick guide to some of the best below. Mark your calendars! Keep checking NBCWashington.com for insider guides, insights and photos from the festival from now until March.